Gregory Crewdson is an artist who uses digital photography. He has a MFA in photography from Yale in 1988. He has exhibited throughout the United States and Europe. 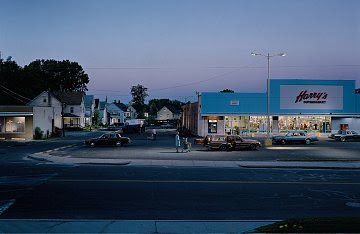 Crewdson is an Adjunct Professor for Yale University School of Art Graduate level Photography. He also has published books of his photography. Crewdson works in two different ways. The first is on location, which makes the photograph have a lot to do with the location and its place or setting. The other is through creating a scene by soundstage. The soundstage is a created world of Gregory Crewdson's making; a space for setting up invented sets. A common theme in his photographs is pregnant women. 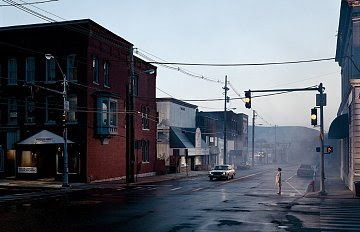 Crewdson says in an interview, here, that he does this because it is the perfect metaphor for an in-between moment. 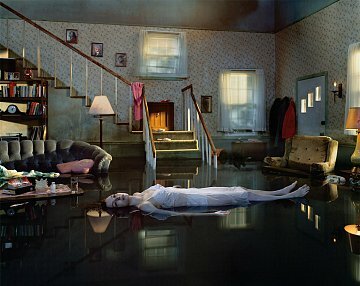 What I love about Crewdson's work is the way his settings take on a life of their own and seem to describe an emotion. My favorite is the one with the girl in the water from the Twilight series. She almost seems like Ophelia. All of the images are taken from the Gagosian Gallery site, here.